Raita, which you will pretty much find on any Indian table setting is like a generous white canvas. You may find it, standing as a perfect dip for Kababs, or a dependable side dish to tame a fiery Biryani. It is so versatile and essential, you may as well call it the Little Black Dress of Indian cuisine! If you are like me, you will lose count—both for the LBDs in your closet and the combinations of Raitas you can conjure up with little imagination! And if you remember middle school Algebra (Permutations & Combinations), just for the sheer pleasure of it, crunch the numbers with the options I have listed here. I guarantee you will be amazed. I believe the reason for Raita’s ubiquitous presence in India is because, it is perfect to cool off the spiciness and heat of Indian food, not to mention, to counter the oppressive heat in many parts of the country. Raita is made with 3 basic ingredients– Yogurt, Onions, Salt. But as I said, that is only basic! See the options below to grasp the possibilities. Need I say it is a tasty way to get your dose of probiotics? By the way, it is funny how probiotics have been an integral part of Indian food from way before probiotics became the in-thing! I make all of the above variations depending on what it is served with. We love Mango Raita, but made very infrequently because finding a fresh and taut ripe Mango in Midwest is a rarity. I typically make fruit Raitas and Cucumber Raitas for spice/heat intolerant people to go along with Biryani or Pulav. I skip Cilantro for Fruit Raitas, but Mint and Chaat Masalas go very well with fruit. I particularly use chilies when serving Raita for heat loving folks. And sometimes even amp it up with a sprinkle of Red Chilli powder and Black Pepper powder for garnish. So pick a favorite combination and mix it up. 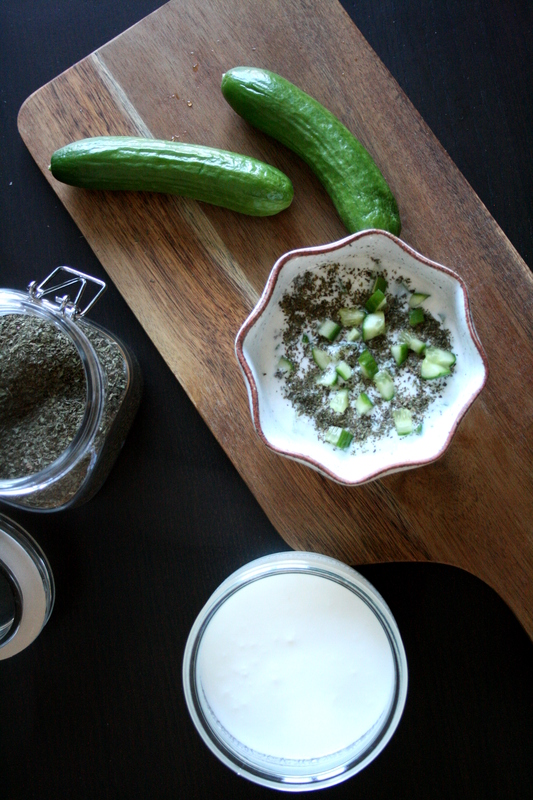 Here is an outline of Cucumber Raita with Dry Mint and Green Chillies. Perfect for serving at room temperature along with any spicy rice or stuffed parathas or Kababs. * I prefer English Cucumber which requires no peeling or deseeding. 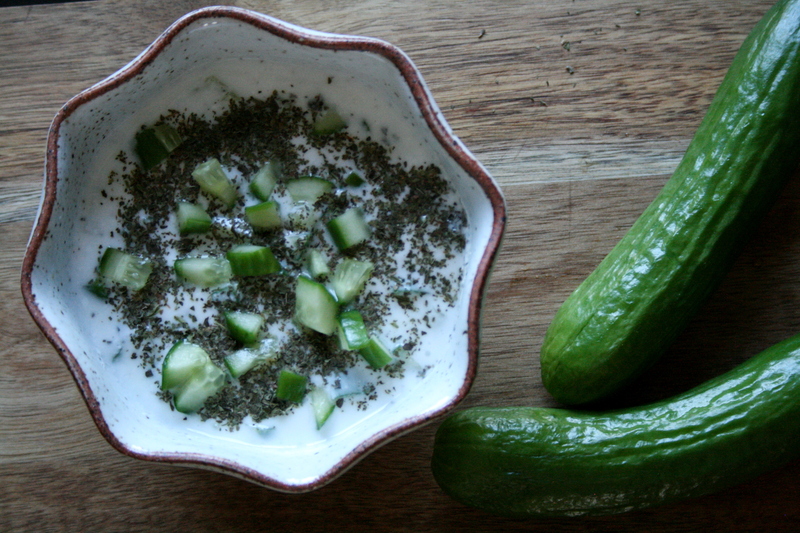 If using a regular Cucumber, there is still no need to peel if the skin and seeds are tender enough to your liking. I had a version of raita many times at a Pakistani restaurant, which they called Punjrunga Acha. I later found out that was pickled veg, and i can’t find any specific recipe for it. Do you know of a variation of Raita with such a mix?